If you’ve cleaned your house or apartment from top to bottom, taken out the trash, taken care of the laundry, and still there remains a faint odor that you can’t seem to locate, chances are that the smell may be coming from your trash can. Even though you may be using liners, small bits and pieces of garbage can escape and fall into the trash can itself. You can also have seepage from wet garbage that was placed in the bag and these will cause the trash can to smell. It may be a case where there are no bits of garbage in the bin, but it still has an odor. Whatever the cause, bins should be cleaned periodically to minimize the presence of odor-causing bacteria. It’s very easy to overlook cleaning the trash can because, after all, you are using trash can liners to avoid the problem of a daily clean up and so may not pay the can much attention. However, it is recommended that you clean the trash can at least once per month to keep it smelling fresh. Cleaning a trashcan can be a messy business and the last thing that you want is to discover that you are in need of something in the middle of the job. To avoid this, gather all of the things that you will need to do the job. The basic items that you will need are rubber gloves to protect your hands, chlorine bleach or disinfectant, a brush with a long handle, a hose, and an old washcloth or paper towels. 1)	Be sure to remove all particles from the trash can before starting. 2)	If the can is being rinsed outside, which is highly recommended, use the hose to rinse. If you do not have an outdoor space, rinse indoors in the washtub, or if none is available use the bathtub. Be sure to thoroughly disinfect any indoor areas used to rinse the trashcan after the job is completed. 3)	Thoroughly spray the surface of the trashcan (including the lid) with the chlorine bleach or the disinfectant and leave it on for at least five minutes. You may need to use a brush to remove any debris that might be stuck to the can’s surface. 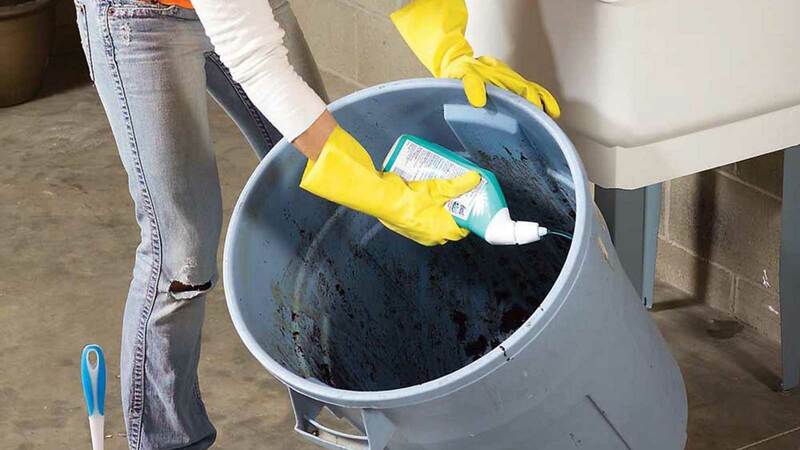 4)	Rinse the trashcan and allow it to dry thoroughly before replacing the liner and the lid. It’s very simple to keep your trash can clean; it’s important that you give it a comprehensive cleaning periodically and have a set daily routine or protocol to minimize messes. The basic thing that you can do is to not overfill the trashcan. It can be tempting to shove the garbage down in the can in order for it to hold more stuff, especially when you are in a hurry and don’t have the time to remove the full liner and replace it with another. However, the problem with this is that it can cause the bag to rip, and the contents will spill into the bottom of the trashcan.